Fort Gratiot County Park is located in the northern part of St. Clair County, just off M-25 on Metcalf Rd. This 30 acre park offers breathtaking views of Lake Huron and 852 ft of lake shoreline/beach. Current facilities at the park include beach access, restrooms, picnic areas as well as a children’s playground and .85 miles paved of walking trails. 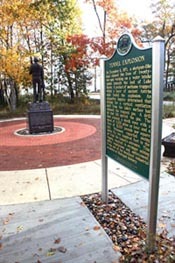 Fort Gratiot County Park is also home to the 1971 Tunnel Explosion Memorial which commemorates the construction accident that took the lives of 22 men working on the water intake tunnel located beneath the park. The 1971 Water Tunnel Explosion Foundation raised funds for the memorial which is now completed. Anyone interested in contributing to the memorial fund should contact the Community Foundation of St. Clair County. In early 2010 the picnic pavilions were completed, an overflow parking area was constructed and additional sections of boardwalk were installed on the beach. A beach groomer has also been purchased and will be used to clean and maintain the beach. All park improvements and equipment are funded by the St. Clair County Parks and Recreation millage. Fort Gratiot Park is open daily from 8:00am to 9:00pm from Memorial Day to Labor Day and 8am to 8pm during the winter. Life guards are not on duty, so take caution and swim at your own risk. Dogs are not allowed on the beach. Dogs are allowed in the rest of the park, but must be on a leash. Please clean up after your pet. For your convenience, pet waste stations are located throughout the park. For more information or to reserve a pavillion, please call the Parks and Recreation office at (810) 989-6960.